This post will remain at the top of the page through Friday, events allowing. To read newer posts, scroll down. And for more Cuba-related news and information, follow Uncommon Sense on Twitter @marcmasferrer. The anti-Castro Patriotic Union of Cuba (UNPACU) has in recent months been one of more active opposition groups on the island. 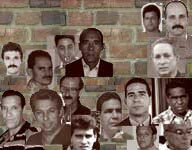 Lead by former Group of 75 prisoner of conscience Jose Daniel Ferrer Garcia, the group has organized protests and adapted Internet technologies to spread its message of resistance and hope. A best measure of UNPACU's effectiveness is how the regime has responded with repression. At least five activists this year have been summarily tried on trumped up charges and sentenced to prison terms. In the most recent case, Ángel Frómeta Lovaina on June 25 was found guilty of "resistance" and "assault," and sentenced to 2 years in jail. Another activist, Yoanni Beltrán Gamboa, said the Castro dictatorship had "invented" the charges as an excuse to send Frómeta to jail, according to Diario de Cuba. Omar Naranjo Borges, 4 years for "dangerousness." Yordanis Gómez Mejías, 2 1/2 years for painting signs denouncing Fidel and Raul Castro.